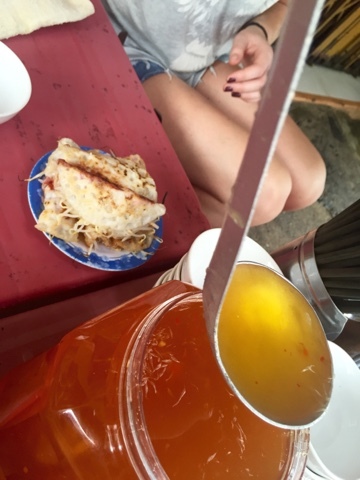 Day 4-5 // Nha Trang – Can you guess how much dinner was? We LOVE street food! 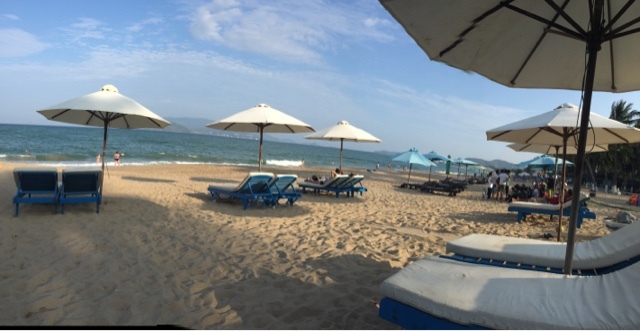 We had a few initial observations in Nha Trang as we departed the bus and headed to our next hostel at 7am yesterday. Firstly it’s a lot less busy than Ho Chi Minh, secondly the air was a lot fresher, we were right by the beach so that explains it! And finally, the amount of Russian people there! Following some Google research it seems that there has been an influx in Russian tourists visiting after a historic relationship with Nha Trang as a port and then more recently 72 chartered flights a month go direct from Russia to Nha Trang airport, with package deals from £470! So cheap and you can imagine with such cold winters why Russians love it. Having never been to Russia it was strange to see Russian written everywhere on signs etc, it’s seems to be a very similar relationship the Brits have with Spain. With a gorgeous beach and relaxing day ahead of us we munched some pancakes and headed down to bargain for some sun loungers. The sea was exceptionally choppy – you definitely couldn’t have a gentle paddle, I was knocked over more than once during mine. We snoozed and read and snoozed some more throughout the day – nothing that exciting to report. During the evening we found ourselves a lovely restaurant for dinner, clearly regularly frequented by locals. We’ve been using the fact that if we see people turn up (usually on mopeds/bikes) specifically to eat at a food stall or restaurant, it must be good! Crispy noodles, squid and beef stir fry was on the table – each meal very delicious. Later on we headed out to experience the night life, which included a lot of trance and techno music, a pool, a game of pool and a huge Russian nightclub! 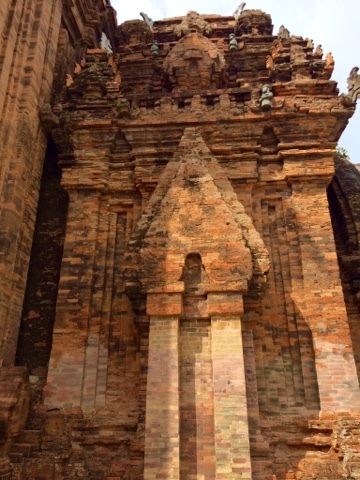 The following morning (after a lot more sleep) we took the number 4 bus to Pho Nagar, a Cham temple tower founded sometime before 781 (so the internet says – there was nothing in English at the site so we had to do research afterwards). 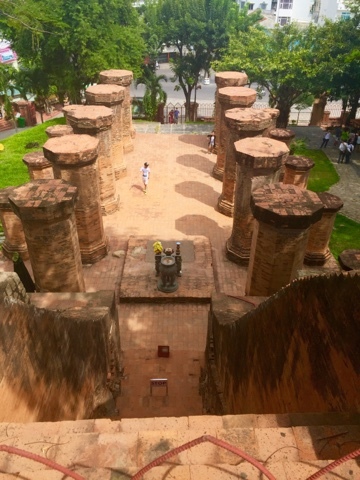 The stonework was impressive, and we were able to peek into the little huts dedicated to Yan Po Nagar, the goddess of the country! A pretty cool building, with a lovely view over the river which had many fishing boats in. We took a walk down there and through the streets, seeing Vietnamese people living their Sunday. It seems everyone here lives life right out on the streets; cooking, cleaning, playing dominoes, eating etc. i love seeing life in other parts of the world. 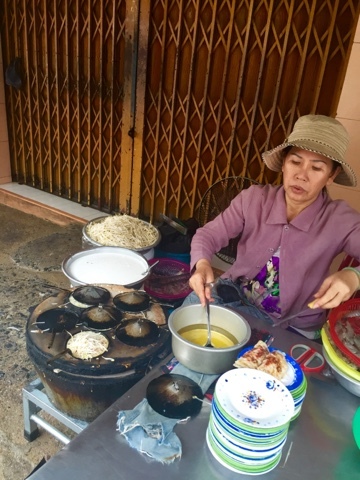 As we strolled past one street food stop, a lady was making really tasty looking pancake things with seafood in. Three of us noticed how good they looked so we went back for some and sat on some tiny plastic stools, and the local lady showed us we had to pop the pancake into the small bowl with this weird orange soup that was delicious, complemented by some lettuce and chunks of lime we munched away – it was so good! 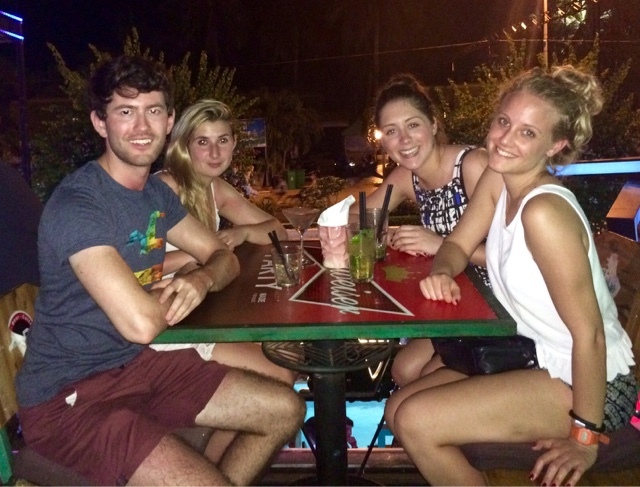 Once we got back to the main part of Nha Trang, Rach, Rosie and I had a Vietnamese massage. Very relaxing but a bit of a surprise when they used hot fiery jars to “pop” the skin. It’s going to be hard to justify eating out when I get home, dinner tonight in the streets was about 80p, and the massage earlier was £5. Crazy prices! !